Lewis Brass & Copper Company can provide you with exactly what you have been looking for. 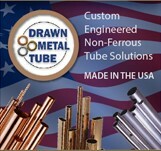 We specialize in meeting your tubing and alloy requirements. Call us or drop us a note with your information and requirement(s). © 2013 Lewis Brass & Copper Company. All rights reserved.